With an abundance of water on the farm, you are sure to see a very wide selection of animals roaming the area. Nestled among the foothills of the Waterberg Mountains, Nuanetzi Private Game Lodge, close to Mookgophong (Naboomspruit), can be considered as the perfect escape to the Limpopo bushveld. Exchange the every day city life for peace, tranquility and a well-earned rest. Thatched Chalets overlooking a large water hole provide the perfect opportunity for game viewing at sunset. 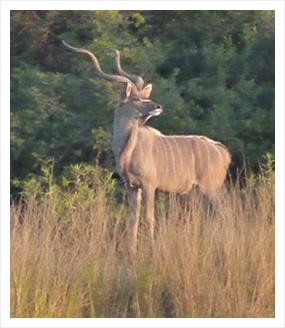 Nuanetzi Game Lodge provides the perfect opportunity for game viewing. Whether your choice is a game walk, a game drive, or you would like to watch game from your chalet, you will enjoy your stay with us. Nuanetzi Game Lodge offers a welcome retreat less than two hours drive from Johannesburg by car and less than 40 minutes drive from Bela-Bela (previously Warmbaths). This close proximity to South Africa’s major metropolis makes it the ideal break-away for a weekend or a mid week stay in a place of breath-taking beauty, exclusivity, clear skies and fresh air. With an abundance of game and bird life, you will enjoy your stay. We have over 14 species of game and over 300 species of birds. The natural surroundings also include an array of identified indigenous flora typical of the Waterberg region (more than 120 different species of trees). Enjoy game drives twice a day and game walks, or sit on the deck of your chalet and watch the game come down to drink at the waterhole. Relax with a refreshing drink in the Pool Bar overlooking the swimming pool or enjoy a cup of coffee or tea in the “Sekelbos” Coffee Bar .